The safety and security of our residents is a top priority, and we are proud to have a very active neighborhood block watch program and a private security patrol in place. If you observe a possible crime in progress, call 911 – let the Police investigate. If you see anything or anyone suspicious, do not hesitate to promptly call Phoenix Police – let the trained experts decide how to respond and how to handle it. The 911 dispatcher will transfer your call to Crime Stop at 602-262-6151, if that is the appropriate response. You can also contact our private security patrol, Blue Steel, on 602-283-4827. 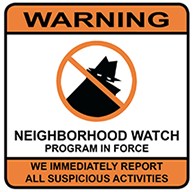 We encourage all Windsor Square residents to become a member of the Windsor Square Block Watch. As well as looking out for neighbors and reporting suspicious activities to the Phoenix Police, you will receive email alerts and communications, and will be invited to occasional meetings. Contact Suzanne Dohrer at [email protected] to be added to the email distribution. If your neighbors do not have email access, help by sharing Block Watch news with them. If you report a crime or learn of something suspicious in the neighborhood, please let Suzanne know. She will share news with the Community Action Officer and other neighbors. Our neighborhood Community Action Officer is Mario Lozoya at Desert Horizon Precinct. Mario can be contacted at [email protected] and 602-534-1745. Windsor Square has private security patrols in place, provided by Blue Steel Security (602-283-4827). If you are going out of town, you can call Blue Steel to arrange for daily house checks. The charge is $5 per day, which is your sole responsibility to pay. You will need to make arrangements for payment directly with Blue Steel for this service, as it is not part of the contracted service for the neighborhood. Help contribute to running the security patrol program by clicking on the “Contribute” button below. Police crime prevention tips and news can be found at the Phoenix Police website. Our neighborhood, like any, has a few crime reports over the year, and the nature of the crimes fluctuates at different times of year, such as burglaries during times when homes are unoccupied and holidays. Block Watch efforts have helped the Police to catch suspects. Call Speed Enforcement at 602-534-SPEED (602-534-7733). Call our Councilwoman Laura Pastor’s office at 602-262-7447 or send an email to [email protected] to lodge a complaint.